Fellow interns, Tenny and Hillary, fixing the pig's fence on the farm at Tenuta di Spannochia. The romantic image of Tuscany is everywhere, images of golden hills lined with cypress trees, romantic gardens, and huge meals eaten around a communal table. However, actually living amidst these images can seem unobtainable for those with a backpacker’s budget; but if you have a sincere interest in organic farming and sustainable agriculture, and can commit to working on a farm for three months, interning at Tenuta di Spannochia provides an opportunity to spend three months living, working, enjoying, and falling in love with Tuscany. Tenuta di Spannocchia is a working organic farm, located 20 km outside of Siena on a nature preserve. Spannocchia is committed to preserving a diverse traditional farm, maintaining an olive orchard, a vineyard, a small vegetable garden, and a number of animals, including sheep, pigs, cows, chickens, horses, and donkeys. The olives, grapes, and garden are all grown using organic methods and the animals are heritages which the farm is committed to helping preserve through their Noah’s Arc program. The primary function of Spannocchia is agrotourism—a place where guests can rent a room or a farmhouse and spend time learning about organic farming in Tuscany and enjoying delicious communal meals each night made from the olive oil, meat and vegetables grown on the farm and served with Spannocchia’s own wine. To help run the farm, Spannocchia also accepts interns for a period of three months in the spring, summer, and fall. Eight interns are accepted each session. Seven of the interns are farm interns and the other two work as guest service interns. The farm interns are each assigned a specialty, ranging from working in the garden, herding sheep, maintaining the vineyard, and pruning trees in the orchard. While most daily activities will focus on your area, there are also times when all the interns come together to work on larger projects, such as harvesting potatoes, repairing the road after a large storm, or helping with various maintenance tasks such as weeding and pruning around the farm. Guest service interns work in the villa, helping to prepare breakfast and lunch, arranging flowers, welcoming guests, and assisting with checking guests in and out. In addition to the required 30 hours of work each week, Spannocchia also provides Italian lessons and educational classes twice a week, usually in the afternoons, and every other Friday all the interns go on a field trip together. The topics of lessons are varied, and range from discussions of genetically modified foods, to how to raise bees for honey, to olive oil tasting. The field trips are equally diverse, from a visit to an on-going archeological dig in a neighboring town, a tour of a vineyard and a wine tasting, or a visit to a pecorino cheese factory and a lunch made entirely of cheese products. 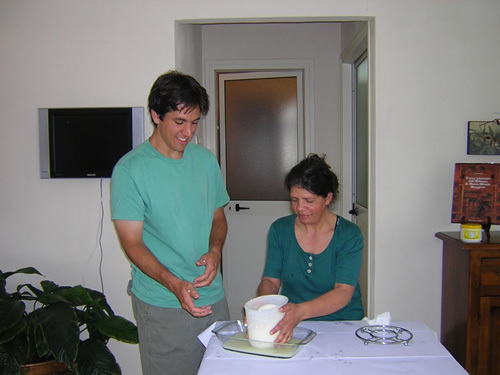 Andy, one of the interns, learning how to make cheese at Tenuta di Spannochia. In addition to their duties on the farm, interns must also help serve dinner to the guests in the farmhouse each night. Interns eat dinners—which are prepared by a professional chef—with the guests, enjoying long, 4-course dinners of pasta, fresh meats, homemade soups, salads, and freshly prepared desert nightly. Every week there is also a major dinner on Wednesday night, which all the interns must help prepare and serve. These alternate between pizza night—where interns get to make the pizza which is baked in a wood-fired oven and served right to the guests—and nostra cena, or “our dinner”, where all the food—even the flour used to make the pasta—is made at Spannocchia. The nine interns form a close bond because they work, live, eat, sleep, and play together. Interns are housed in a building next to the main villa. The housing includes shared rooms and linens as well as a communal kitchen and living room. Interns prepare breakfast and lunch themselves, usually eating the leftovers from the night before. Interns are also responsible for keeping their housing clean with rotating duties each week. Most weekends are free, although some jobs have rotating weekend duties. During the weekends, the interns have the use of a van for short trips, often visiting nearby hill towns, going to dinner and then a swim in sulfur springs, or going to Siena to use the Internet. Interns often go on trips together, exploring other areas in Tuscany and other regions in Italy. During free time on the farm, there are many low-tech ways to amuse yourself, including long walks in the woods, running on the trails, drawing or painting the landscapes, dressing up with clothes from the communal closet, socializing with guests, playing a fiercely competitive game of bocce, (Italian bowling), trying to make fried zucchini blossoms, or reading. 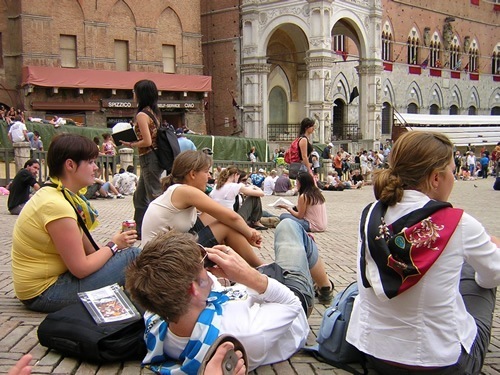 Interns relaxing and waiting for the annual Palio to begin in Siena. If you are interested in becoming an intern you must complete an extensive application, which includes three reference forms as well as several essays. If you make it through the first selection process you will be notified about a phone interview with the program director. This is a chance to make sure both that you are right for the program and the program is right for you. Make sure to get your application in early, since the application is due several months before the start of the session. You can find the application, as well as additional information about the internship at www.spannocchia.org/internships/. Spannocchia is truly a magical place, one of great beauty and involving many forms of sensory experiences, including watching the sunrise over the hills in the morning, finding wild boar and deserted castles hiking through the woods, watching a pig give birth, helping to shear sheep, harvesting fresh tomatoes in the garden, and sitting down among friends each night to enjoy a freshly prepared meal. The internship also involves a lot of work, and Spannocchia wants to make sure that interns are aware that they are expected to do 30+ hours of hard manual labor, cleaning stalls, digging trenches, laying fences, weeding, and many other difficult and monotonous tasks. Your internship is not simply viewed as a 3-month vacation in Tuscany. If you are truly interested in sustainable and locally produced food, preserving traditional food cultivation methods, and learning more about Italian culture, language and customs, then you should certainly apply. More information as well as the application can be found at www.spannocchia.org/internships. Make sure that you demonstrate a real interest and commitment to sustainable agriculture and farming in your application, as they receive many more applications they can accept. An internship involves a US$200 education fee to help pay for Italian lessons and field trips. You must also become a member of the Spannocchia foundation which costs US$30 dollars and you must also join WWOOF Italia, which costs 25 Euros. Interns must purchase their own tickets to Italy, but the program will pick up interns in Siena. All necessary food and lodging is provided, however it can be helpful to have some additional funds for foods not provided, Internet use, and any additional travel. Katherine Pittore was an intern at Spannocchia in the summer of 2007. She is currently continuing to explore the world and is based in Nha Trang Vietnam where she teaches English at the University of Nha Trang. In her free time she writes, explores the beach, attempts to speak Vietnamese, and drinks copious amounts of coffee.